Australia has no better science writer than Julian Cribb. He is knowledgeable, extraordinarily well informed and superbly adept at presenting accurate, fascinating information in a way that just begs to be read. 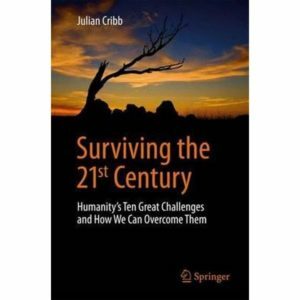 His latest book is Surviving the 21st Century: Humanity’s Ten Great Challenges and How We Can Overcome Them. The fact that we havesurvived for 16 years of the century shouldn’t lull us into thinking that the remaining 84 years will be straightforward. I write this review on the day WWF report that ‘worldwide populations of mammals, birds, fish, amphibians and reptiles have plunged by almost 60 per cent since 1970 as human activities overwhelm the environment’. Each chapter in Surviving the 21st Century considers a great challenge, including mass extinction, resource depletion, weapons of mass destruction, climate change, universal toxicity, food crises, population and urban expansion, pandemic disease, dangerous new technologies, and self-delusion. It’s easy to describe problems, more difficult to proffer solutions. Cribb does this at each chapter’s conclusion in a section called ‘What we must do’. Surviving the 21st Century does something that few other publications do: it comprehensively addresses all the main threats to us and to our planet. The holistic approach offers more hope than efforts to tackle problems individually, which can sometimes make matters worse. Cribb knows intuitively how to convey information vividly and accurately. Writing about frogs, he states, ‘Two in every five of their known species face extinction’. That expression grabs you more than the ’40 per cent’ that most scientists would write. Years ago, US journalists coined the term ‘Hey Martha’ for stories and news items so amazing that when you hear them, you just have to shout across the room, ‘Hey Martha, listen to this!’. Surviving the 21st Century is full of such examples. They grab your attention and make you think, which is the whole point. Hopefully, sufficient numbers of people thinking will lead to action. Here’s a ‘Hey Martha’ from the book: What consumes 10 kg of topsoil, 800 litres of fresh water, 1.3 litres of diesel, a third of a gram of pesticide and causes 3.5 kg of carbon dioxide to enter the air? Answer: the last meal you ate. Now multiply that by all the meals you’ve consumed and all the people on Earth. No wonder we have a problem. As Cribb puts it, ‘the human jawbone is among the most destructive of implements on the planet’. You’ll be hard pressed to find a page without a fascinating factoid. Cribb certainly does his research, and knows how to craft that research into unforgettable messages. What’s his recipe for curbing the impact on planet Earth of our insatiable hunger? Sustainable urban food production using recycled water and organic waste; teaching the next generation to value and respect food; apply a food levy to pay farmers and indigenous peoples to restore and maintain the environment; introduce a ‘Year of Food’, teaching respect, awareness and appreciation of food, in every junior school on the planet. There are many more suggestions on the menu. Each is thought provoking and a number are completely original. It doesn’t matter if you disagree with some of the ideas or think that they may be unfeasible, Cribb has set out a range of options well worth considering. Doing nothing is not one of them. If you’d like to pursue any of the idea and possible solutions, Surviving the 21st Century includes a detailed list of references. The ‘sapiens’ in homo sapiens means ‘wise’ in Latin. We can demonstrate wisdom by getting hold of a copy of Surviving the 21st Century and applying some of the recommendations to our own lives. We can recommend the book to others. We can alert our leaders to the book and its contents. We owe this to ourselves and to our planet.